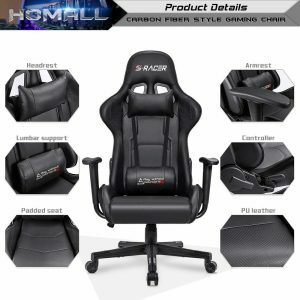 Black Homall S-Racer is an adjustable, PU leather, multifunctional gaming and racing chair that is ergonomically and orthopedically designed. It can also be used as an office computer desk chair with a lumbar support and headrest for your comfort. The rating for this large gaming chair is 4.2 out of 5 stars by 178 customers on the day of this review. Homall S-Racer is offered as black S1, black S-2 and black S-5 models with different price tags. It feels very stable on a very sturdy steel frame and a top design base. The great quality carbon fiber type PU leather offers both comfort and style even when you sit on the chair all day long. The maximum total user weight is specified as 300 pounds. This large and comfy chair weighs 48.5 pounds and measures 33.5 x 25.5 x 11 inches, with the back measurements of 22.5 x 30.5 inches and the bucket seat measurements of 19.8 x 20.5 inches. The multi-functional Homall Chair swivels 360 degrees and has a rocking backwards function between 90 and 180 degrees with the tilt locking mechanism that locks the back at 90 degrees upright and 180 degrees positions. The padded seat height is adjustable to 3.2 inches with the gas spring cylinder and with the smooth armrests, the detachable lumbar cushion, the headrest pillow and the adjustable seat height you have a pretty comfortable seat. As a versatile gaming chair it can be used at home, office, gaming rooms or conference rooms. The chair is designed to the natural shape of the human body. The back of the chair provides plenty of support for your head, neck and shoulder. PU leather with carbon filter used on this chair is furniture quality, wear-resistant and is easy on the eyes. The chair is easy to move around on its color caster wheels. The back of the chair can be reclined to any angle up to 180 degrees with the button on the side. The base with the hard thick plastic bridge design (metal hardware, piston and mechanical pieces) is fixed with the preset holes that the bar goes into. The pillow at the lower level is used for lower back support for when you shall be sitting long hours on the chair. You can remove it when you don’t feel comfortable. The arm rests that are firmly fastened by screws are also detachable if you prefer them that way. PU leather is made of a leather backing with an embossed polyurethane surface. This is not a high-end chair and is not priced for that, but looks like one and has some decent features and build quality. Overall it offers more than how much it costs. It comes with the Homall Exchange Warranty that lets you get it exchanged in case of missing parts, damage or installation issues. You can ask for the refund of your money or a replacement if you are not happy with the product, without incurring any fees.